1 Thes 1:7 And so you became a model to all the believers in Macedonia and Achaia. 8 The Lord’s message rang out from you not only in Macedonia and Achaia— your faith in God has become known everywhere. Therefore we do not need to say anything about it, 9 for they themselves report what kind of reception you gave us. They tell how you turned to God from idols to serve the living and true God, 10 and to wait for his Son from heaven, whom he raised from the dead—Jesus, who rescues us from the coming wrath. What God does in your life is not just for your sake. You are a letter written by the Holy Spirit for others to read. You are intended to be a model to all other believers by your words and actions spurred on by your faith. What you learn from God for your own life is meant to be shared with other believers in encouragement. Hebrews 10:4 And let us consider how we may spur one another on toward love and good deeds, 25 not giving up meeting together, as some are in the habit of doing, but encouraging one another — and all the more as you see the Day approaching. 1 Thes 5:10 He died for us so that, whether we are awake or asleep, we may live together with him. 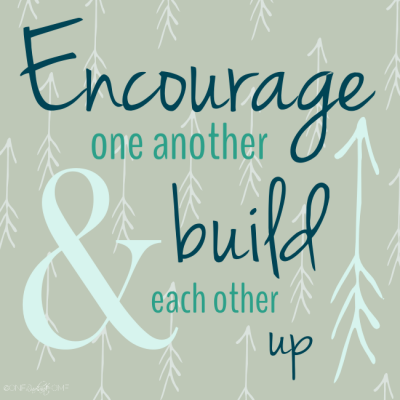 11 Therefore encourage one another and build each other up, just as in fact you are doing. 1 Thes 5:7 I charge you before the Lord to have this letter read to all the brothers and sisters.